I will start off this review by saying that there will be MAJOR spoilers, both for the book and the movie in this review. Consider yourself warned. I went to see the movie this past weekend with my mom, since she’s the one who got me to read these books in the first place. I was mostly optimistic – even though I’m pretty critical with movie adaptations, I usually give them the benefit of the doubt. Unfortunately, I had pretty high expectations for this one – I am a big fan of the books- but the movie fell pretty far short of them. For the sake of trying to end on a high note, I will start off with my complaints and end with what I thought they did well. As far as changes between the book and the movie, there were way too many of them. I accept that there has to be changes, but some of them made absolutely no sense. There was a new element added where Clary starts drawing this symbol over and over again to illustrate that the spell that repressed her memories of the Shadowhunters is weakening. I guess they did it to have some sort of visual representation of the fact, but it just came across as being a little weird. Also, when Clary and Simon enter the Pandemonium club, it’s the first time they had ever been there, whereas in the book, it was some place they went all the time. Clary was drawn to that place because there was usually Downworlder activity going on there. Magnus Bane. I love me some Magnus Bane, but the portrayal in this movie was only so-so. Which is unfortunate, since he’s such an important and interesting character in the books. He really fell flat, and I don’t know whether it was because of the actor or because of the direction. He was way too serious. Magnus in the books is always joking at the Shadowhunters’ expense. He had very little personality in the movie, which was very disappointing. Isabelle was way, way too nice. In the books, she is contemptuous of pretty much everyone except for the Shadowhunters. In the movie, she is encouraging Simon to come with her and help her with things. Huh? She’s supposed to look down on him because he is a Mundane and therefore useless in her eyes. The dialogue. I know Cassandra Clare didn’t have the opportunity to write the screenplay, and I have no idea if she was even interested in doing so. But one of the things that make her books so much fun is that the serious action is cut with this clever, quippy, snarky dialogue. There were a couple of tiny flashes of it here and there in the movie, but not much. No where near enough. Valentine’s. Usually I’m not too concerned if you change a character’s appearance. So what if movie Harry Potter had blue eyes instead of green? Big deal. But with Valentine, it was a really bad choice. In the book, Valentine has blond hair and looks very angelic. He is very cultured and urbane and has a way of sounding very reasonable even when he’s suggesting the most atrocious things. I pictured someone similar to Lucius Malfoy (in face Jason Issacs would have been perfect for this role). Instead, the movie gave us this dark, creepy biker looking guy with braids in his hair who snarled everything he said. Bleh. The “Jace and Clary are siblings” plot line was absolutely destroyed. I don’t know why they did this. In the book, Valentine tells Jace that he is his father, which makes it so much worse when you find out that he’s Clary’s father as well. Jace and Clary are in love (although they don’t fully realize it) and hearing that they are actually siblings is devastating. You spend a good portion of the series thinking that they are doomed. In the movie, the audience finds out straight away that this story is a lie. Even though Jace and Clary still don’t know, it takes that added layer of tension and strips it off completely. Again, no reason to do this. For the most part, I liked the casting (with the exception of Magnus, Valentine and Hodge). 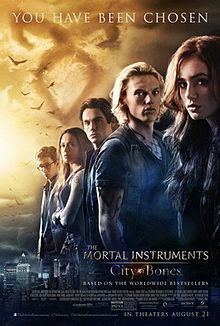 I thought Lily Collins did a wonderful job as Clary. Lena Headly and Aidan Turner also did well as Jocelyn and Luke. I didn’t completely buy Jamie Campbell Bower as Jace, but I think part of that was because his usually snarky dialogue had been gutted. Movie Jace didn’t have a lot of personality, and that definitely wasn’t Jamie’s fault. He wasn’t given enough to work with. He and Lily had really nice chemistry, so I can forgive the rest. I especially liked Robert Sheehan as Simon – one of my favorite characters in the books and he did it quite well. The CGI was pretty spectacular. The demons in particular were disgusting and scary and perfect. The scene where Clary has to fight the one in her apartment after her mom disappeared was very good, as was the one possessing Madame Dorthea. I also liked the look of the portal (although they messed up how they were used) and the effect of when the Mortal Cup was removed from the Tarot Card. I want to go to the Institute. Or rather, I just want to go into the Institute’s library. Holy cow, that was awesome! The journey into the City of Bones was pretty scary. I liked the Silent Brothers, although I thought their voices were a little too heavy. The ritual where they tried to tap into Clary’s memories was chilling and very well done. The scene in the greenhouse was beautiful. The flowers were just right and it lent just the right atmosphere for Jace and Clary’s romantic scene. The fight scenes were very well choreographed. I particularly liked how Isabelle’s whip looked on film. I will probably go see this movie again, just to try and absorb more of it. There was a lot to see. I can’t say that I didn’t enjoy it, but I did leave the theater feeling like they had really missed some opportunities. The movie could have been a lot better, but I guess it could have been worse. And for anyone interested, on Sunday, Bibliophiles Anonymous will also upload our review. You think I was critical? You have no idea. Be sure to check it out! Next Post Bibliophiles Anonymous #48 – Where’s the Snark? Actually, in the book, we knew Valentine was Clary’s father before we find out he’s claiming Jace as well. Either way, they absolutely DESTROYED that in the movie – that was one of my BIGGEST complaints after I saw it. Not only that, they RUINED the books for those people who haven’t read them, but might choose to after watching the movie. Because it isn’t until the end of the third or fourth book that you find out that they AREN’T actually siblings… the audience has no clue until then. That ruins a major plotline of at least two books. Which is what pisses me off more than the fact that they changed it. As for the rest of what I think… we’ll talk about that tonight, and everyone can hear it Sunday.